The PCA has teamed up with other local NGOs in a massive SRC campaign to raise funds for various initiatives to conserve the Roodekrans Ridge habitat. Our campaign is now live. Check out our awesome video and conservation objectives on https://www.thundafund.com/project/eagles, and help. Ensure the long-term survival of the Black Eagles of Roodekrans and the Albertina Sisulu Orchid as well as the natural beauty of the Sugarbush Ridge Ecosystem that supports them. This entire ridge is highly threatened by rapid urbanization, it is home to several red data plants and animals as well as other wildlife. The project seeks to establish a protected environment for the ridge ecosystem for sustainable use and enjoyment by the community for the long-term future. To conserve southern African indigenous orchids in their natural habitat. To engender a real interest in indigenous orchids which will render them valuable and worthy of protection. WOSA supports and partners in efforts to preserve orchid habitats and works with land managers and owners to create conservancies and reserves as well assisting with restoring indigenous orchids where populations have declined. WOSA aims to establish seed and fungi collections to support research and conservation. To develop protocols and procedures for the propagation of indigenous orchids to assure successful establishment and maintenance in natural habitats where populations are declining or have been lost due to development. Indigenous orchids are a natural treasure and their survival can only be assured by an effective education program to elicit the support of the public, Government, agriculture and industry. This will be achieved by informative articles in the media, social networking, exhibitions and active engagement with all roll players. Wild orchids have highly complex reproductive systems ( often dependent on a specific pollinator ) and interesting system for nutrition ( involving a symbiotic relationship with a fungi ) that assures the species survival. This helps to explain why most orchids cannot be grown in captivity.Take a photo and conserve the orchid in situ, for future generations to enjoy it in its natural habitat. Very little is known about indigenous orchids by the public who are largely unaware that there are over 450 species of which 45 are endemic (only occur in South Africa). Very little research has been carried out regarding ecology, conservation and propagation although a number of species have become extinct and habitat destruction is progressing at an alarming rate. Up until now there has been no attempt to address these issues on a National scale and Provincial legislation and cooperation is fragmented. Only through a focused National integrated effort that engages the public and all roll players will survival of orchids be assured. Bill Mincher enjoys the outdoors and served many years with FOSAF the Federation of Southern African Fly Fishers. During this time he was instrumental in creating the successful Yellowfish Working Group (YWG) which is cited as one of the greatest success stories in angler-driven conservation ever achieved in South Africa. Together with enthusiasts from the three Gauteng Orchid Societies of Witwatersrand Orchid Society, North Gauteng Orchid Society and East Rand Orchid Society, they formed Wild Orchids Southern Africa (WOSA), based on the principals of the YWG. WOSA is now going National with support from the other regions gaining momentum. It gives me great pleasure to welcome you to our Third National Conference. Since the launch of WOSA at the 21st World Orchid Conference a lot has happened although it seems like only yesterday. We have registered as a Non-Profit Organisation and a Public Benefit Organisation which allows us to issue certificates for donations and tax relief for the donors. We have received two important donations one from Mark Shuttleworth for the launch of WOSA and creation of the Wetland at 21st World Orchid Conference. The other was a donation from Nicky and Strillie Oppenheimer for the printing of the Flowers of Verloren Valei Guide and they also assisted the Proteadal Conservation Association with initial funding for the Albertina Sisulu Orchid court case. Professor Steven Johnson’s research focuses on pollination biology, evolution, plant speciation, insect-plant relationships, and floral deception and mimicry. He obtained a B.Sc. (Hons.) and Ph.D. in Botany from the University of Cape Town in 1994. He then worked as a post-doctoral researcher at the University of Haifa in Israel and at Uppsala University in Sweden before moving to UCT where he was a Smuts Post-doctoral Fellow. He is currently a full Professor at the University of KwaZulu-Natal, and holds the DST/NRF South African Research Chair in Evolutionary Biology. During the course of his career he has published or co-published more than 270 peer-reviewed scientific papers and book chapters, as well as four books: Table Mountain: a Natural History (1999), Cape Orchids (2012), Orchids of South Africa (2015) and Floral Mimicry (2017). He has served on the editorial boards of Oecologia, Arthropod-Plant Interactions, and Proceedings of the Royal Society: Biological Sciences and has acted as a reviewer for numerous other journals. He started working at Verloren Vallei in the mid 1990s. Natural hybridization is an important evolutionary process that can act as a bridge for gene flow between species, generate new variation, and even precipitate formation of new species. Orchids are an ideal plant group for assessing the incidence of natural hybridization as they are well-studied and form hybrids that are relatively easy to identify using floral traits. Here I provide an illustrated compendium of the putative natural orchid hybrids recorded in South Africa and ask whether natural hybridization is concentrated in particular lineages or floristic regions. There are 0.082 reported natural hybrids for every orchid species in South Africa, which is similar to the value of 0.09 reported for angiosperms in general. The largest number of putative natural hybrids is found in Disa (17 hybrid combinations involving 25 species) and Satyrium (11 hybrid combinations involving 13 species). The weighted average hybridization propensity (percentage of possible hybrid combinations realized) for South African orchids is estimated to be 0.92%, which is much lower than the value of 6% reported for orchids in seven other mainly temperate northern hemisphere floras. Natural hybridization appears to be more frequent in the Cape Floristic Region (documented for 15% of orchid species) than in the rest of South Africa (documented for 8% of orchid species). The factors that govern variation in the frequency of natural hybridization among orchid species are still largely unknown and require further investigation. Karsten has been growing orchids since he was 14 when he first found a colony of Eulophia ovalis ssp. bainesii in Robindale, Randburg. Whilst studying to become a Mechanical Engineer at the University of Stellenbosch he published a book entitled Growing South African Indigenous Orchids in 1996. After leaving university Karsten stared both a family and a business, and orchids had to take a back seat. Now that both those undertakings have become firmly established he has returned to his love of orchids and is concentrating on propagating species and hybrids from seed. He is currently Vice-Chairman of WOSA. The propagation lab is currently housed in an outbuilding cottage which is also used for visitors that stay for a while. Before the visitors arrive, the complete lab needs to be re-located to various other parts of the house including a Wendy-house. This is now done well in advance after an experience where the visitors came back into the house for breakfast after the first night and shyly asked why the cottage had this peculiar hospital smell to it. It turned out to be the smell of the sterilising solution used to sterilise the laminar flow and surfaces that was still lingering. Propagating South African indigenous orchids comes with its own set of unique problems. Initially, very little data was available on how to grow specific species and genera from seed. Further challenges involve obtaining viable seed, sterilising the seed to obtain contamination-free cultures and then finally de-flasking the plants and getting them to mature, grow and flower successfully. The presentation is a summary of the work done in the last 30 years on the in-vitro and ex-vitro propagation of indigenous orchids and focuses on some of the pitfalls and successes achieved. My love for orchids started in high school when I bought my first plant, which, I am pleased to say, is still alive. I matriculated from an Agricultural high school, studied horticulture at the Pretoria Technikon and received my B-Tech degree in 2007. After being employed as a senior horticulturist for some years, I eventually decided it was time to do my own thing. Together with Nollie Cilliers, we started Plantae Orchids, an orchid and rare plant nursery. We strive to supply the local market with the latest hybrids and also sought-after species. As a member the Orchid Society of Northern Transvaal, I soon realized I wanted to become an orchid judge. I qualified in 2008 as a judge with the South African Orchid Council and currently serve on the SAOC board as president. I was the show chairman of the 15th National SAOC Orchid Show hosted by the Rustenburg Orchid Society which is now my home society. September 2013 saw the release of ‘Anyone can grow orchids’ - a book authored by Nollie Cilliers and myself. We expect it to act as a guide for South African orchid growers and gardeners. This book as well as talks at orchid societies, garden clubs and conferences is my way of sharing a love for orchids with like- minded people. I love seeing orchids grow in nature and we take every available opportunity to go and search for orchids in the natural habitat. Africa is known for the vast open plains which contain the big five, the great migration of wildebeest and zebra as well as the great varied range of wonderful indigenous flora. The Cape floral kingdom is one of the regions with such great diversity. There is, however, a wondrous variety of orchids which can be found on the continent and its surrounding islands. These are perhaps less known. Arguably, the best known South African orchid is Disa uniflora while Angraecum sesquipedale is surely the Madagascan species with which people are most familiar. In the horticultural world, plants from Africa have made a huge contribution. A myriad of species and hybrids with their roots in Africa are known all over the world and produced in their millions to be sold for the use of gardeners and the cut flower trade. We must only think of plants such as Proteas, Perennial and annual plants such as Nemesias, Diascias, Osteospermum, Pelargonium etc; then there are those used as indoor plants in the colder regions or landscape plants in warmer regions, e.g. Clivia, Strelitzia, Asparagus, Dracaenea and the list goes on. Bulbous plants such as Zantedeschia, Ixia, Freesia, Ornithogalum and many others are known and used all over the world. The horticultural value of these plants is undeniable, but can the same be said about the orchid species occurring in our region and the hybrids derived from them? African and Madagascan orchid species and their hybrids are in high demand with orchid collectors in most parts of the world. As far as the species are concerned, the rarer the better or the more bizarre, the higher the demand. This applies especially to orchid collectors and these plants are then sold in various different sizes. They are seldom in flower as people are just too happy to get a plant so they do not mind what size it is. Getting these to flower in their own collection is part of the thrill. But the big question is: Can these plants compete with the pot plant orchids of the world? Do they have it in them to make it through the stringent evaluation most reputable pot plant producers have before taking on a new line into production? Firstly we must clarify what we will define as a plant having horticultural potential. Then we will look at the various trial stages and selection criteria pot plant growers use when it comes to mass production of plants. We will consider the numbers which make a horticultural line viable Then we move on to some species, selected forms/varieties and some of the current hybrids to evaluate their potential, weigh up the pros and cons and suggest a way forward. Marco is fairly new to the orchid scene having previously done an honours degree in invasion biology at the University of Pretoria. Having grown a particular interest in plant-pollinator interactions during his time at TUKS, he proceeded to join up with Professor Steven Johnson and Dr Timo van der Niet at the University of KwaZulu-Natal. His master's research primarily involves unravelling the pollination biology of the fairly unknown terrestrial orchid genus Bonatea. Marco hasn’t looked back since joining the pollination lab in 2016 and has indulged in this interesting and widespread orchid genus, leading him to travel through most parts of South Africa and even warranted a short trip to Kenya. The terrestrial orchid genus Bonatea Wild. includes 13 species and is distributed along, and confined to the eastern seaboard of southern and east Africa, occurring in the grassland, savannah and forest biome. Flowers are typically green and white, strongly scented with a single nectariferous spur. The genus is characterised by extensive basal fusion of the sepals, petals and stigmatic arms with the presence of a perianth tooth in the spur mouth. Here we document several recently discovered pollination systems through direct observation, photography, and motion triggered cameras. Field studies in southern and east Africa showed that flowers of B. antennifera, B. polypodantha, B speciosa and B. steudneri are pollinated exclusively by hawkmoths. These species are characterized by traits such as crepuscular scent emission, pale white-green lower petal/labellum lobes (often threadlike) and long spurred flowers with large volumes of dilute nectar. Bonatea cassidea was visited exclusively diurnally by butterflies. It differs from all other species in diurnal scent, mostly white-coloured flowers with shorter spurs and lower nectar volume. We conclude that floral variation is mainly associated with divergent use of the same pollinators, although differences in scent/colour also play a role in determining specialized nocturnal versus diurnal Lepidopteran pollination. Having progressed in the field of threatened plant conservation since 2006, I capacitate a network of volunteers from a range of socio-economic backgrounds to survey and conserve South Africa’s plants of conservation concern. I am inspired by creating opportunities for and engaging with students to partake in the sector. I mentor several individuals as they take on internships and progress into the workforce. Determined to increase Human Capital Development within the botanical sector, I engage with 3rd year Botany, Environmental Science, Nature Conservation and Horticulture students at several universities in KwaZulu-Natal, Gauteng, Limpopo and Free State provinces. Apart from my leadership role within the CREW programme, I am the Chair of the Botanical Society KZN Coastal Branch, where I actively support the activities of plant conservation. I serve as Vice-Chair of the Durban Inner-City Faith-Based Conservancy to support the eThekwini Municipality in their efforts to create a greener, healthier, more livable environment in the Durban Inner City. Also, I organize the Botany session at the annual Symposium of Contemporary Conservation Practice to ensure Botany is a prominent theme at the conference as well as on the student award committee. The Custodians of Rare and Endangered Wildflowers (CREW) is a citizen science programme that bridges the gap between science and society. CREW is a partnership between the government agency, the South African National Biodiversity Institute (SANBI), and the non- governmental organisation (NGO), the Botanical Society of South Africa, which brings botanists and the general public to help conserve South Africa’s most threatened plants. Furthermore, the programme is regionally-based, ensuring citizen scientists receive hands-on training to ensure specific information is collected over a long-term. We survey and monitor threatened plants across the country while working closely with NGOs, conservation agencies and landowners to create awareness. With 25% of South Africa’s plant species listed as threatened or Rare in the Red List of South African plants, programmes like CREW are becoming increasingly important for the conservation of our exceptionally rich botanical heritage. South Africa is home to 483 Orchid species, of which 128 are of conservation concern. The genus Disa has the highest number of species threatened by extinction. The paper shall showcase a few species whereby CREW citizen scientists have contributed to data collection that enabled the species to be reassessed accordingly. CREW citizen scientists are vital for the functioning of this national body. The help that these remarkable individuals provide to the programme is instrumental for the identification of areas in need of conservation. With government conservation agencies experiencing ongoing loss of capacity and funding, the contribution of CREW citizen scientists to the conservation of South Africa’s flora is invaluable. The data collected is used to update existing information on plant species of conservation concern and feeds into land use planning and decision making at the different tiers of government. The success of the CREW programme is directly linked to the passionate people who volunteer their time and resources to assist in national conservation efforts. Prof Joanna Dames is a Microbiologist/Mycologist and completed her BSc and BSc Honours degrees at the University of KwaZulu-Natal in Pietermaritzburg. After some work experience she obtained her MSc and PhD degrees from the University of the Witwatersrand where she also worked as a Research Assistance and Technical Officer in Biochemistry. Prof Dames joined Rhodes University in 1997 as a lecturer and was Head of the Department of Biochemistry and Microbiology for over 7 years. She is currently Deputy Dean of Science, lectures in Microbiology and runs an active Mycorrhizal Research group. She has graduated 46 postgraduate students at all levels, and is an NRF C2 rated scientist. She shares her passion for mycorrhizal fungi through public talks and articles. Mycorrhizal fungi form a symbiotic relationship with the roots of majority of plant species and are divided into various types based on the fungi and host plant species involved and the structures they form in and around the roots of plants. The relationship is regarded as mutually beneficial enhancing nutrient uptake particularly from harsh environments and increasing tolerance to stress and resistance to pathogens on the host plant side. In return, the fungi obtain photosynthetic carbon from the host plant. All orchid species form a unique relationship with fungi belonging to the Ascomycota and Basidiomycota these mycorrhizal relationships have not been studied in South Africa. The orchid mycorrhizal interactions can vary from mycoheterotrophy to mixotrophy. Under natural conditions, a continuum of these relationships are likely to exist. Regardless of the physiological type all orchids are unified by their ‘dust seed’ morphology and mycorrhizal interactions, which are interdependent. The lack of food reserves to support germination makes these orchids dependent on mycorrhizal fungi for the provision of nutrients and development of the protocorm. The importance and characteristics of this relationship will be highlighted in this presentation. Modjadji Makwela is a student with the University of Pretoria and completed her Bachelor in Sciences in Microbiology at the University of Pretoria in 2016 and has just completed her Honours in Microbiology on the exciting subject of mycorrhiza with her advisor Dr Almuth Hammerbacher and co-advisors Tanay Bose and Prof Brenda Wingfield. Tanay Bose completed his Bachelor in Sciences and Master of Sciences in Botany in Calcutta in 2007 and then specialized in the taxonomy and molecular Systematics of Fungi – completing his Doctorate in Microbiology with the University of Pretoria last year. Both Tanay and Modjadji will be presenting their paper DIVERSITY OF MYCORRHIZA WITH ENDEMIC SOUTH AFRICAN ORCHIDS. HABENARIA BARBERTONI in two parts with Modjadji kicking off with part 1 and Tanay then taking over with part 2. The conservation of wild orchids requires the presence of mycorrhizal associations. However, for most South African orchids, these symbionts are not known. To identify the mycorrhizal fungi associated with Habenaria barbertonii both culture dependent and independent approaches were used. DNA extracted directly from orchid roots as well as from fungal cultures was used for DNA barcoding. Results showed that H. barbertonii associates with the mycorrhizal genus Ceratobasidium. A culture of this fungus allows for further research into its effect on orchid seed germination. Future research will deal with the implementation of mycorrhizae in conservation approaches for South African orchids. Personal surveys and detailed literature searches indicate that a total of 133 species of epiphytic orchids occur in Malawi, 8 of which are endemic. While over 90% of Malawi’s epiphytic orchids occur in the rapidly diminishing areas of moist and dry woodland across the country, most epiphytic species are restricted to relatively small areas of suitable habitat, usually found at higher elevations. Five particular mountainous habitats, three in northern Malawi and two in southern Malawi, contain 108 species of epiphytic orchids, including all the endemic species. These small mountainous habitats represent critically important refuges for epiphytic orchids and deserve improved conservation. Andrew Hankey is a Botanical Horticulturist and works for SANBI at the Walter Sisulu National Botanical Garden where he is the Assistant Curator / Specialist Horticulturist. Andrew and his Proteadal Conservation Association team including Tony de Castro and Belinda Cooper have been instrumental in pushing the conservation of the Albertina Sisulu Orchid into the public space and his presentation is titled: COMMUNITY BASED INITIATIVES FOR THE CONSERVATION OF THE KRUGERSDORP RIDGES AND THE ALBERTINA SISULU ORCHID. The conservation of the unprotected and largely unfenced areas where the Albertina Sisulu Orchid occurs would quickly become degraded due to increased pressure from the rapidly urbanising peri-urban fringe which surrounds the population. While work continues to try and secure some form of formal protection, the duties of caring for the greater habitat needs to continue, this has fallen to the community in the absence of any action from the private and municipal landowners. The Proteadal Conservation Association (PCA) was formed in 2012 for the purposes of protecting the remaining ridge habitats from being lost to urbanisation, consequently on the ground activities have largely fallen on the shoulders of volunteer members of the PCA. In this paper we elucidate some of the challenges faced and activities addressed by active members of the PCA and their allies. Globally, orchids include some of the most threatened plant species and the entire family is listed as CITES appendix 2 reflecting the breadth of these threats as well as the challenges of mitigating them. The large number of threats are likely a consequence of both narrow habitat requirements of many orchids as well as their specialized biotic interactions. The South African orchid flora includes 481 species (509 taxa: species, subspecies and varieties, but excluding hybrids), across 54 genera but 75% of these species belong to just 11 genera. Of the 509 unique taxa, 334 (66%) are endemic to South Africa, Lesotho and Swaziland. The vast majority of these taxa have been screened by the SANBI red listing efforts. Analyzing these data reveals that 88 taxa (17%) are of conservation concern (EX, CR PE, CR, EN, VU or NT) and a further 42 (8%) are naturally rare but are not currently threatened. Of the 334 endemic taxa, 80 (24%) are of conservation concern and all but one of the naturally rare taxa are endemic. Forty percent of the threatened taxa occur in the summer rainfall areas while sixty percent occur in the winter rainfall areas. Only 49 taxa are found in both summer and winter rainfall areas and two of these are considered vulnerable. Individual species assessments include descriptions of threats. The most frequently implicated threats include invasion by alien vegetation (24% of cases), urban development (19%), Agriculture (15%), overgrazing and trampling (7%), fire mismanagement (6%), collection and flower picking (5%), forestery (4%), mining (3%) and pollinator loss (3%) among numerous others (e.g. medicinal collection, infrastructure development, eutrophication and pollution, erosion and fragmentation). Thanks to SANBI’s efforts, South Africa has an advanced understanding of the status of our orchids and the threats that they face. 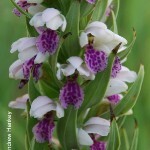 It was decided to place the discussion with regards to common orchid names on hold pending a proper literature search. That would generate a list of current common names associated to the various species and then a more detailed discussion could be held with respect to finding suitable names for the orchids that did not have common names. “BROADENING WOSAS FOOTPRINT AND GETTING PEOPLE INVOLVED” HOW DO WE REACH AND RECRUIY PEOPLE IN THE SOCIAL MEDI AAGER? SAOC. REGIONAL SOCITIES AMD HE FACEBOOK COMMUNITY PROJECT AND INVOLVEMENT (WOSA PROJECTS, CITIZEN SCIENCE, OrchidMAP, SOUTH AFRICAN ORCHIS ENCYCLOPAEDIA ETC. The discussion held centred around increasing the footprint of WOSA. In particular the plan of having WOSA chapters form in other parts of South Africa was debated. The issue is how to involve the enthusiasts outside Gauteng and a proposal was made to possibly form chapters as sub-committees within existing orchid societies. Survana Parboo (CREW) opened up the conversation noting that WOSA was restricting itself by only looking at orchid societies. What was really needed was exposure to everyone that was interested in plants and flowers and she suggested that WOSA perhaps affiliate with BOTSOC (Botanical Society of South Africa), CREW and possibly the Wildlife Society. That would open up WOSA to a much much larger and broader audience and allow WOSA to spread its wings beyond Gauteng. Promotion of WOSA could for example include presentations and setting up of banners and posters at BOTSOC meetings. An additional possibility was to be able to tap in on BOTSOC resources (for example promotion in the magazine Veld & Flora). In addition, talks could be done by WOSA for the Association of Botanists. A further point of discussion centred around the promotion of WOSA via social media. A point was made that many youngsters would not necessarily attend a meeting such as that of the orchid societies yet they would be very active on social media with regards to issues around and concerning orchids. WOSA may need a youngster to run the social media platform like Facebook and in particular also Twitter and Instagram. Examples would be to have live tweets going out from the Conference with interesting snippets of information as the speakers present their papers – or while looking at orchids in the field. That running commentary would appeal to a few and help promote the aims of WOSA at the same time. WOSA needs to find a youngster to handle that. It was also noted that the Orchids of Southern Africa group for example was very active as a Facebook group. 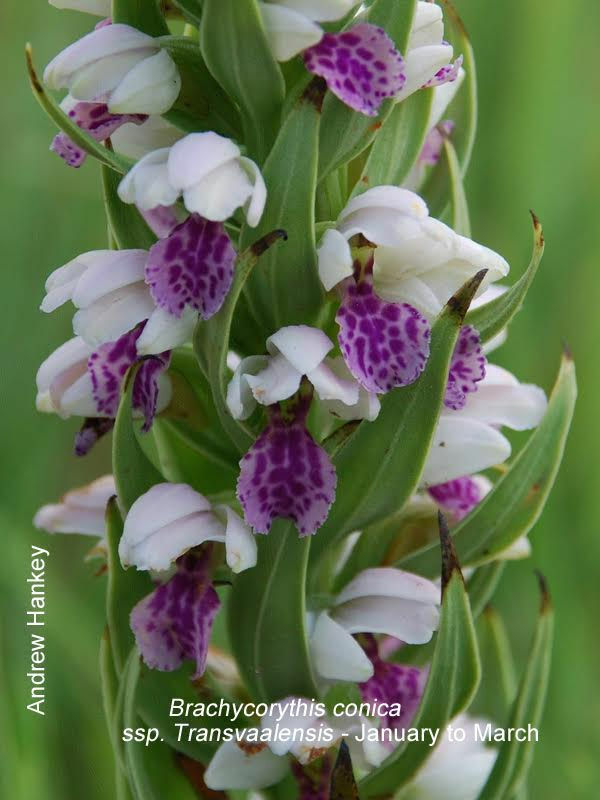 The Fourth Wild Orchids Southern Africa Conference was held at the Goodersons Drakensberg Gardens Hotel from 25-27 January 2019. The venue was selected to give delegates the opportunity to see the indigenous orchids of the southern Drakensberg during outings on the Friday before and the Sunday after the Conference. More than 21 orchid species were seen on the field trips that were arranged by the KZN CREW teams led by Julie Braby. These trips were designed for those that simply wanted to step out of the vehicles into the orchids to a light amble through the grasslands or the more challenging walks. Delegates were able to choose the walk most suited to their liking. Each group was accompanied by a guide from the local CREW team. The Conference was preceded by the WOSA AGM on the Friday evening with the Conference kicking off on the Saturday morning. Jimmy Pauck opened the Conference with the opening address presented by Karsten Wodrich. Prof Steve Johnson gave an enlightening talk about the reproductive strategies with emphasis on the pollination biology of our indigenous orchids. Veteran orchid grower Jim Holmes followed with an insight into growing indigenous terrestrial orchids. He grows many of these using the principles of keeping mycorrhizal associations with the plants intact. MSc Student Dean Phillips then presented his much anticipated phylogenetic and morphologic studies on the genus Stenoglottis culminating in a taxonomic proposal for the systematic revision of the genus. His research was fresh off the press under supervision of Prof Benny Bytebier and a formal publication of the results is currently in preparation. After a short tea break Dr. Peter Ashton presented the genus Polystachya in South Africa accompanied with spectacular photographs of each of the species found in South Africa. Prof Craig Peter presented his talk: A synthesis of the threats to and conservation status of South African Orchids. Craig explained the red list classification of orchids and then using OrchidMap and herbarium data, he extracted various traits, classifications and distributions from the data relating to the threats facing the various groups. His talk proves the invaluable tool that OrchidMap gives researchers. Martin Rautenbach presented numerous interesting ‘abnormalities’ amongst our indigenous orchids showing some spectacular and interesting variations of orchids that remain to be conclusively identified, presenting identification challenges to the botanists at the conference. Some of these orchids may even prove to be new species. Prof. Joanna Dames presented orchid mycorrhiza in layman’s terms and again stressed that the importance of mycorrhizal fungi is currently still majorly underestimated. She presented the various research projects currently underway in her department and posed the question whether it is possible for mycorrhizal fungi to connect trees and other plant species to each other via the fungal network below the soil. The movie Avatar comes to mind where the connection between trees and other organisms may no longer be fiction but could be proven to be reality. A sumptuous buffet lunch was enjoyed in the Hotel restaurant before the presentations resumed in the newly renovated Conference Hall. Mycorrhizal fungi research results by MSc student Modjadji Makwela was presented where both fungi found in the roots in Habenaria barbertonii and Habenaria epipactidea and in the soil around the plants were identified and compared to mycorrhiza found elsewhere in the world. Currently research to determine the effectiveness of the isolated mycorrhizal fungi for the germination of the orchid species that they were isolated from is underway. Dr. Tanay Bose, Modjadji’s research supervisor, then presented his research in using DNA analysis for identifying all fungi present in the soil in the area that Habenaria barbertonii and Habenaria epipactidea are found in and presenting some of the possible conclusions that can be drawn from the difference in sheer number of identified fungi in the soil around the orchids and soil from an area without orchids. The team of Prof. Hammerbacher, Dr. Bose and Modjadji Makwela from the University of Pretoria and the team under Prof. Joana Dames from the University of Pietermaritzburg must be considered some of the top researchers in the world with regards to the topic of mycorrhizal fungi. Tying in with the research done by Modjadji and Dr. Bose, Gerrit van Ede gave a detailed look into the challenges of conserving orchids on his plot just outside Pretoria. He highlighted the importance of keeping alien invasive species in check, the effects of vegetation change and most importantly the correct application of burn cycles that all affect the orchid species survival or demise. After a short tea break the Assistant Curator of the Walter Sisulu National Botanical Garden, Andrew Hankey gave a post mortem of the crowdfunding exercise for the conservation of the highly sensitive mountain ridges behind the Botanical Garden and the conservation of the Albertina Sisulu orchid and the Black Eagles. The exercise brought in funds around R 80,000.00 that can now be used for conservation related expenses. Richard Braby then presented his pending publication ‘It’s my Religion – A photographic guide to the orchids of the Southern Drakensberg’ that is due for publication later this year in March or April 2019. The evening was finished off with a buffet dinner in the Vine Knot restaurant during which Gerrit van Ede gave a short summary of the Friends of Verlorenvallei. Sunday morning kicked off with a discussion and the formulation of the plan around the funds that Prof. Craig Peter had secured for sowing seed of Diaphananthe millari. The idea is to re-introduce plants not only into the original locations where they have been stripped by muthi collectors but possibly also introduce them into trees on private property and municipal trees. The Sunday outings were well attended, and the weather cleared to give a full view of the Southern Drakensberg towards the afternoon. A very big thank you to the KZN contingent and in particular the conference organisers Jimmy and Enone Pauck and Julie Braby and her team that made the Conference a memorable event. Delegates and speakers have commented that this was the best Conference sofar. A Field guide to the wonderful floral diversity of the Verloren Valei Nature Reserve in Mpumalanga - A RAMSAR Wetland Site. Compiled by Gerrit van Ede whose intimate knowledge of Verloren Valei and its botanical treasures makes this a must have for all lovers of indigenous wild flowers. Traditionally orchid distribution data was recorded by collecting herbarium specimens. OrchidMap takes the recording of orchid distribution data into the 20th century. Anyone can now contribute to the distribution data by simply uploading photos of any orchid found in its natural habitat - together with location data - into OrchidMap. Any contributions are welcome! This location data can then used for a multitude of applications - from Environmental Impact Assessments through to determining correlations of flowering time with climatic conditions. The data is now accessible to anyone - from the serious researcher right through to the orchid enthusiast. Detail location data is securely protected and maps and locations publically accessible in OrchidMap are restricted to squares of approx. 26km x 26km. The critically endangered orchid Brachycorythis conica ssp. tranvaalensis was officially named the Albertina Sisulu Orchid at the launch of the Sisulu Circle at the Walter Sisulu National Botanical Garden on the 10th July 2018. The prestigious event was attended by members of the Sisulu family, the Minister of Environmental Affairs Dr. Edna Molewa, The Minister of Tourism Mr. Dereck Hanekom as well as representatives of the Department of Environmental Affairs, SANBI, Mogale City Municipality and community members. A bronze statue of the late Walter Sisulu overlooking the spectacular Sisulu Circle at the entrance of the Garden was unveiled as part of the proceedings. Karsten Wodrich, Vice Chairman of WOSA gave a short presentation to the reasons why the name Albertina Sisulu Orchid was chosen for the critically endangered orchid before presenting a limited edition print of the magnificent orchid by renowned artist Daleen Roodt to members of the Sisulu Family Mr Max Sisulu and his wife Elinor. The framed print was jointly sponsored by the Proteadal Conservation Association and Wild Orchids Southern Africa. Currently, the only viable population of around 120 plants of the Albertina Sisulu Orchid is found a mere 2.5km from the Sisulu Circle as the Black Eagle flies. This area currently under threat of development which will also be encroaching on the hunting grounds of the majestic Black Eagles. The Record of Decision by the MEC to allow development in the area to proceed is currently being contested in a High Court application by community organisations. In his presentation Karsten pointed out that if the developments were allowed to go ahead there was a very strong possibility for the orchid to become extinct in our lifetime. He pleaded for everyone to 'Do the right thing', to stop the proposed development and proclaim the area a reserve in order to preserve the orchid for generations to come and with that also preserve the memory of a very special person Ma Albertina Sisulu. Both the ministers and the mayor of Mogale City noted that it was in everyone's best interest for the issue to be settled out of court and voiced their commitment to finding a way of settling the issue. We have been searching for a popular name for one of the most beautiful indigenous orchids which is on the verge of extinction. Plans are afoot to develop land at Proteadal, bordering the Walter Sisulu National Botanical Gardens, Mogale City (Krugersdorp). The last known viable colony on the planet of Brachycorythis conica subspecies transvaalensis occurs in these hills. If these plans are allowed to go ahead it may put paid to the species. A campaign is being waged by the Proteadal Conservation Association (PCA) in the HIGH COURT to review the Record of Decision (ROD) by the Gauteng MEC approving the development that is a serious threat to the colony. In this campaign we needed to find a common name that can be pronounced and will be recognized as the rallying point of the campaign. We have selected the name Albertina Sisulu Orchid, honouring one of the shining stars in our history. This name has been endorsed by the Sisulu family and we have designed this logo from the painting of the flower and plant by botanical artist Daleen Roodt. Help support our conservation objectives on https://www.thundafund.com/project/eagles by making a donation. Save Mogale City’s critically endangered Albertina Sisulu Orchid!